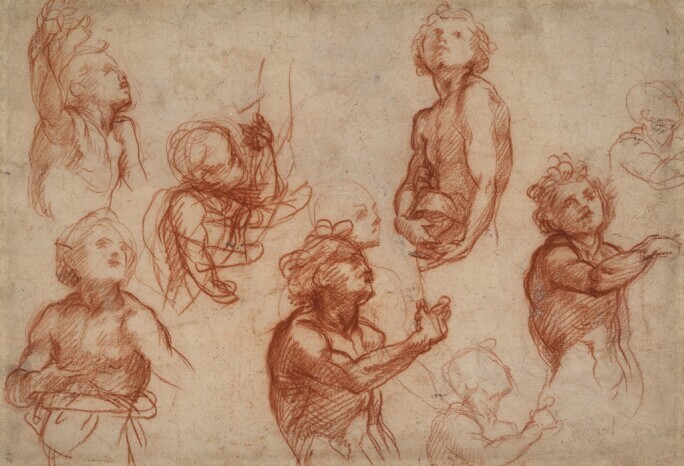 Andrea del Sarto, Studies of children, ca. 1520, red chalk. © The Trustees of the British Museum (2017). All rights reserved. Bridget Riley is known for her 1960s and 1970s paintings of stripes, grids and mind-bending patterns. So it’s surprising to learn that the British artist cites Renaissance and Impressionist drawing as vital influences. So fundamental is life drawing to Riley that, in 2013, she approached the British Museum with a concern: artists working today are lacking opportunities to look closely at great drawings. We can thank Riley for her distress; out of it has arisen Lines of Thought: Drawing from Michelangelo to Now, an exhibition of works (including two by Riley) from the British Museum’s collection. After touring the UK, the show just opened at its final venue, the RISD Museum in Providence, Rhode Island, where it is on view through 7 January 2018. 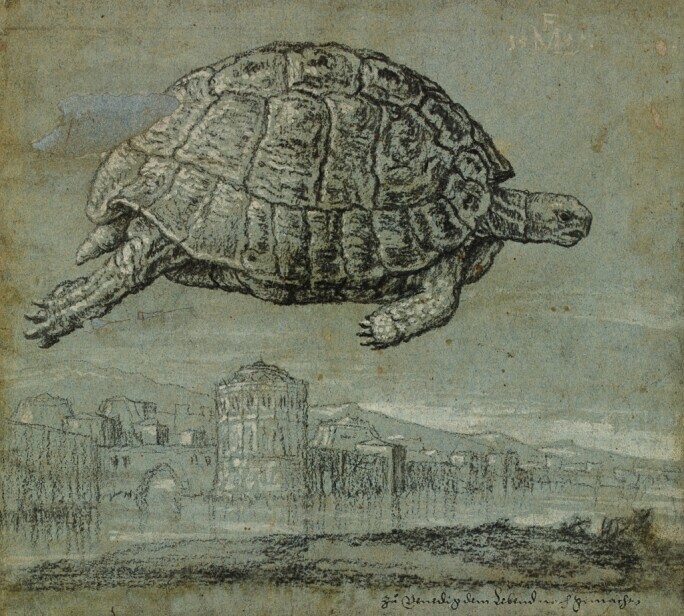 Melchior Lorck, Tortoise and view of a walled, coastal town, 1555, charcoal, heightened with white. © The Trustees of the British Museum (2017). All rights reserved. “These are the best drawings we have ever sent out for an exhibition,” says Hugo Chapman, who oversees the British Museum’s collection of 50,000 drawings (and two-million-plus prints). Curator Isabel Seligman spent three years on the project, culling the museum’s vast holdings for a selection of 70 drawings by many of the medium’s game changers: Durer, Rembrandt, Rubens, Ingres, Daumier, Degas, Seurat and Picasso, to name just a few art historical giants, along with such contemporary stars as William Kentridge, Julie Mehretu and Rachel Whiteread. 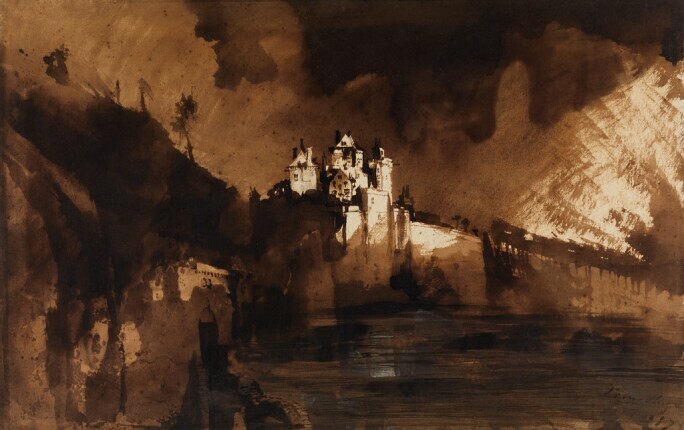 Victor Hugo, Landscape with a castle, 1857, brush and brown wash, with stenciling, pen and ink and touches of white gouache. © The Trustees of the British Museum (2017). All rights reserved. While it is full of recognisable names, Lines of Thought is not a collection of “greatest hits” or preparatory sketches for famous paintings. Divided into sections such as “Brainstorming” and “Enquiry and Experiment” the exhibition reflects on why artists draw, and demonstrates how the process connects the hand to the mind. What really sets the show apart, however, is that the chosen works were crowdsourced. Initially, Seligman selected a group of works from the museum’s holdings, which she then presented to drawing classes at several art schools in England. The students were asked to choose a drawing to study, reinterpret or react to in their own practice. The most-chosen works are among those in the exhibition, which also includes a selection from the RISD Museum’s own collection. 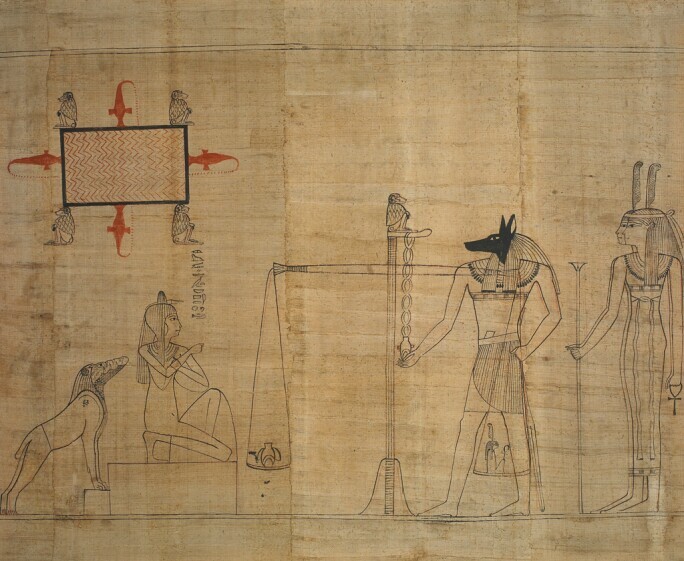 Egyptian, Book of the Dead: the final judgement scene, ca. 940 BC, red and black ink on papyrus. © The Trustees of the British Museum (2017). All rights reserved.